This object is a Seneca Competitor View Camera made by the Seneca Camera Manufacturing Company. The Competitor View was a part of the view camera series that the company created. View cameras are bigger and more complex to use than the roll-film cameras that were commonly used prior to digital cameras. The view camera was typically used for landscapes, architecture, and portraits. 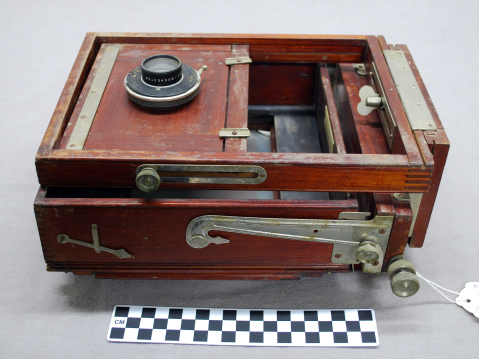 This type of camera captures the image on either an emulsion coated glass plate or sheet film. The Competitor View came in three different sizes 5 x 7, 6 ½ x 8 ½, and 8 x 10 inches. The Seneca Camera Manufacturing Company started in 1895 and was based in Rochester, New York. The founders named the company after the Seneca-Iroquois tribe that was indigenous to the New York area. They often showed a Native American holding one of their cameras in their ads and brochures.Seneca mainly made simple cameras for the everyday person, including box cameras and folders, a folding camera. Portrait of George Eastman (1854-1932) , founder of Eastman Kodak Company. Image via WikiMedia Commons. 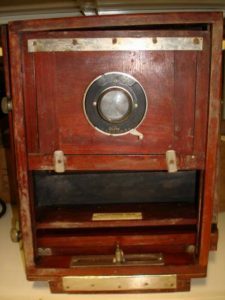 The company did well until 1924 when it was sold to Conley Camera Company who was a subsidiary of Sears Roebuck & Company. Both the Seneca Camera Manufacturing Company and Conley Camera Company’s biggest competitor was the Kodak Company. The Kodak Company started off as the Eastman Kodak Company and founded by George Eastman who had the idea for a camera that was easier to handle when on trips when he was just 24 years old. Eastman was traveling to Santo Domingo, the capital of the Dominican Republic, and a coworker suggested that he take pictures on his trip. At the time the only camera that he could take with him was a large view camera, while looking for a camera for his trip he became fascinated with photography and wanted to make the process easier. “KODAK’S DIGITAL REVOLUTION”. BRW -MELBOURNE-. 22: 78-81. Pritchard, Michael. A History of Photography in 50 Cameras. Richmond Hill, Ontario : Firefly Books, 2015. Simmons, Steve. Using the View Camera. Brattleboro, Vt. : Echo Point Books & Media, LLC, 2015. Wade, John. A Short History of the Camera. Watford [England]: Fountain Press, 1979.